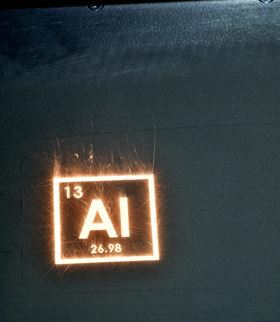 Researchers have hit on a simple solution that could radically broaden the range of metal alloys that can be produced by additive manufacturing [Martin et al., Nature (2017), doi: 10.1038/nature23894]. Additive manufacturing or 3D printing promises to eliminate the constraints imposed by economies-of-scale manufacturing. The technique is a printing-like process in which an object is built up layer-by-layer as a precursor powder or solution is rastered across a surface. Components of great complexity can be made to order, individual components can be customized, and time-to-market of new products can be reduced. But only a few of many thousand metal alloys can be printed in this way. One issue is that the metal powder has to be melted by an electron or laser beam as it is deposited, in a process akin to welding, to fuse each layer together. Because solidification rates are much higher than in conventional casting processes, 3D printing can result in severe cracking, particularly in aluminum alloys. To overcome these difficulties, researchers from HRL Laboratories and the University of California, Santa Barbara have devised nanoparticle nucleants that can be introduced into the process to control solidification during additive manufacturing. Finding the right nanoparticle nucleant for a specific alloy was made possible by a software tool that matches a range of crystallographic properties, such as lattice spacing and density. From over 4500 powder and nanoparticle combinations, the team selected hydrogen-stabilized zirconium nanoparticles to stabilize the production of two aluminum alloys. 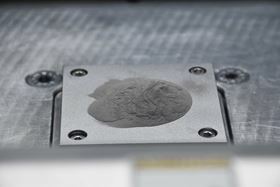 Aluminum alloy powders were coated with the hydrogen-stabilized zirconium nanoparticles and additively manufactured into 80 × 80 mm components. 3D printed components without the nucleant additive show large grains and high levels of cracking. By contrast, alloys with the nanoparticles show small, equal-sized grains and no cracks. “We’ve used a 70-year-old nucleation theory to solve a 100- year-old problem with a 21st century machine,” commented John Hunter Martin, who co-led the research effort with Brennan D. Yahata, in a statement. The affect on the properties of 3D printed aluminum alloys is dramatic. Without the additive, the alloys have almost no strength at all because of the high level of cracks. With the zirconium particles, the alloy shows an 80% increase in strength taking it into the realm of conventionally produced components. Increasing the zinc component in the feedstock powder and optimizing heat treatment could improve what differences remain. Processing parameters could likewise be adjusted to reduce laser damage and trapped gas, which would improve the ductility and elastic modulus of the alloy. The researchers believe that the approach could be applied to other crack-susceptible or non-weldable alloys such as nickel alloys, superalloys, and intermetallics that are currently not amenable to 3D printing. The advance could also enable the development of a wide range of new alloy systems specifically for 3D printing and bring its revolutionary ideas of individualized production to aerospace, automotive, and biomedical industries. This article was originally published in Nano Today (2017), doi: 10.1016/j.nantod.2017.10.006. 3D printing company 3D Metalforge has opened the 3D Metal Additive Manufacturing Centre (AMC) in Singapore.